Got an old sweater you are willing to sacrifice for the cause? Try my EASY SWEATER PUMPKINS! Or better yet...head to the thrift store! You can also raid the thrift stores to create these super easy NO-SEW SHIRT PUMPKINS! These EASY BURLAP PUMPKINS add texture to your fall decor! Faux pumpkins are fun to dress up for fall…like my COUNTRY LIVING INSPIRED DECOUPAGE PUMPKINS. And even an inexpensive trick-or-treat jack-o-lantern looks good as a BURLAP PUMPKIN PLANTER! Don’t forget scrapbooking paper turned into PLEATED PAPER PUMPKINS…such a fun way to add a little fall pizzazz to a centerpiece! I just raided my faux pumpkin stash and repurposed an old grapevine wreath form to create this POTTERY BARN INSPIRED PUMPKIN WREATH…so it was free! I love pillows and I love pumpkins…so what’s better than a pumpkin pillow! I used the leftovers from my no-sew shirt pumpkins to create this PUMPKIN SHIRT PILLOW! And I couldn’t resist giving this one a frenchy twist! It’s my linen and burlap VINTAGE FRENCH PUMPKIN PILLOW. Miss Ozzie says not to forget that pumpkins play an important part in Halloween, too! So I created this INTERCHANGEABLE FACE JACK-O-LANTERN PILLOW! My little grands love it! There’s even a pocket on the back to store the extra pieces! I just couldn’t resist trying this one when I found a sheet of buggy craft paper! It’s my BLACK AND WHITE DECOUPAGE BUGGY PUMPKIN! This was a fun project…with lots of fun patterns to choose from! It’s my EASY DUCT TAPE PUMPKINS! And that's it...but I'm still looking for those real pumpkins. A trip to the pumpkin farm may be in order soon! YOU are one very creative lady, great line-up! My favorite is the Country Living pumpkins! So fun! I have not seen any pumpkins yet either :-( I suppose we in blogland get a bit too excited for Fall to begin. C'est dommage. However, you have given me the inspiration to plow forward (ha ha) and make some of my own. Your pumpkins are too cute! Merci!! 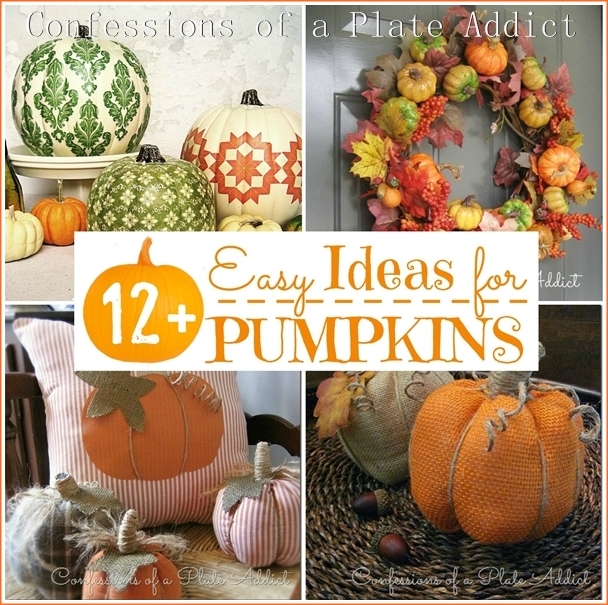 !Really cute ideas for pumpkins! Thanks for sharing with us. Your pumpkins are great and so many ideas. thanks so much for sharing this with us. Some really pretty pumpkins. I saw some the other day at Walmart. They were pretty big and $4.99 for any in the big display. Good luck on finding pumpkins. I don't know if you have Sprouts there, but they always have great pumpkins and are priced very good. Happy Hunting.